The spring is sprung, the grass is riz, I wonder where the birdies is? I bet they’re in the garden. Conduct a survey this September & October and find out. 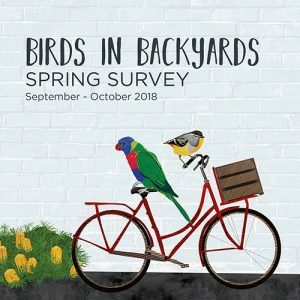 Head over to Birdata and get your Birds in Backyards Spring Survey in today. Plus you can win one of three great prize packs for participating this spring! Read all about Birdlife Australia’s busy counting season and their fabulous prizes here. Also, the Winter Survey results are now in. A total of 202 people surveyed 227 sites around the country and counted a total of 20,405 birds across 258 species. Not a bad effort! Get the state-by-state breakdown, see how we’re tracking from the Autumn Survey, and learn more about why we are seeing so many parrots, pigeons and pesky birds throughout the country by visiting the Birdlife Australia website here.